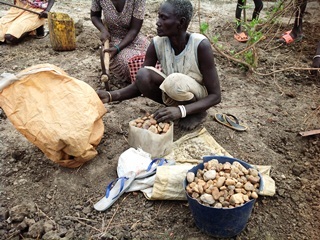 Women and children in South Sudan have resorted to crushing gravel to fight the threat of hunger in the otherwise oil-rich region. In a series of interviews with Sudan Tribune, women and children as young as 10, spoke on how their daily lives depended on stones to not only earn a living, but also to meet education costs. Following the introduction of tough austerity measures, initiating in last year’s oil shut down, South Sudan’s economy is on the verge of a major collapse as multiple reports claim. Forty year old single mother Elizabeth Nyawuok Gai says her life has been extremely difficult since South Sudan gained independence in July 2011 and raising her seven children alone has not been an easy task.“My coming here today was because of my small son who got sick and this forced me to join these groups of women in digging gravels. I’m not a resident of this town. 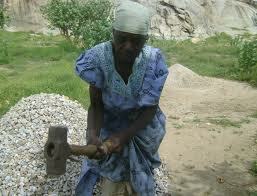 I came from GoliGoli deep in the village to collect gravels in order to take him to the hospital,” she said. In most parts of Southern Sudan soar up to 99 degrees, sometimes hitting a staggering 104 plus degrees. This creates working conditions that sometimes cost people their lives. According to Gai, on the average day each woman makes about 10 South Sudanese pounds (about $3), which they use to feed, pay for medical needs, education and other expenses that their children need.